This is my 40th installment of Babywearing Stories 365. Each installment features a babywearer in 1 photograph and their answers to 5 questions. My goal is to normalize, promote and celebrate daily Babywearing, moving beyond *what* we use to carry our babies and shifting focus back on *why* and *where* we carry. I hope to share the stories of moms, dads, and babywearing caregivers all over the world. Enjoy! 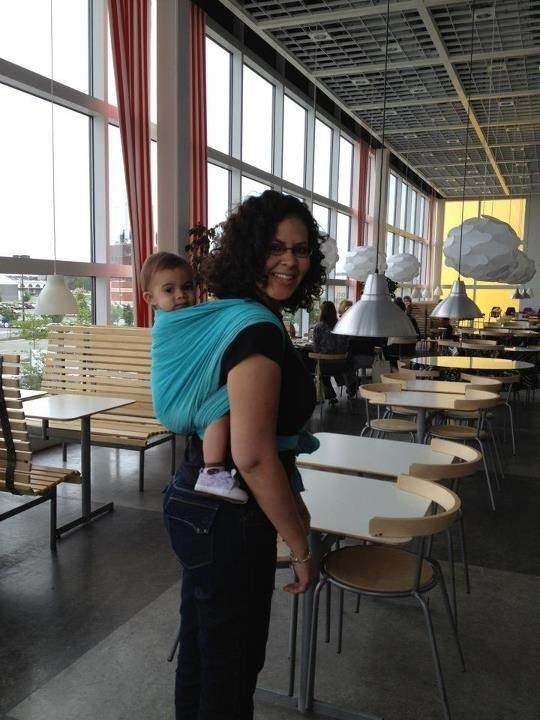 This photo is special to me because it was the first time we had a successful back carry in a wrap. I was sooo excited! We are in a DIY woven wrap made from Onasburg by a good friend of mine. I spent the day with my friends Summer and Amanda and their littles cruising Ikea ( south philadelphia).